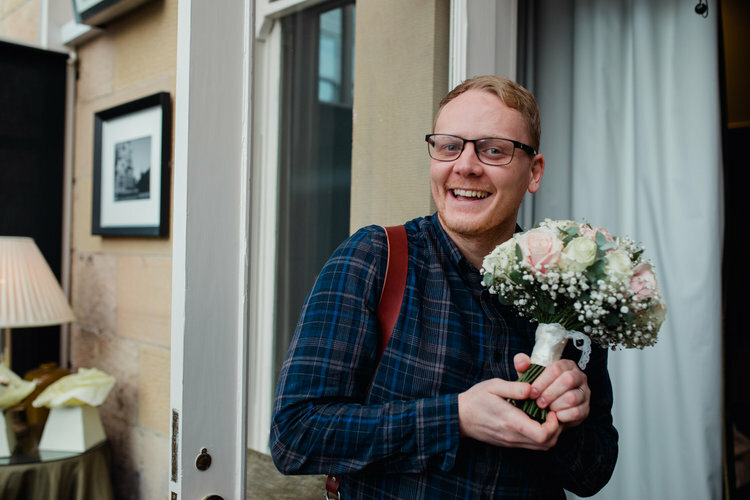 Here’s me, looking like Sean from Coronation Street (I get told this at every single wedding) having a good time at a wedding. The bride took this photo and I think this one photo of me sums up my approach pretty well. Weddings are about celebrating and having a good time with your friends and family. Why shouldn’t your photographer fit right in with that. I’m there all day so lets enjoy it together! - I love photography (obv) and especially wedding photography. - I'm 36 years old and became a dad for the first time in January 2019. Her name is Imogen and she is a wee cookie bun. - I live in Hamilton, just outside Glasgow. - I got married in July 2016 and this experience gave me a whole new perspective. I fully understand how important these photographs are. - I'm a big music fan. I played in bands for 10 years and loved it! I love heavy metal but definitely mellowed in my old age. - My wife, Jennifer, makes fun of me because I'm a sucker for love. Being around people in love is amazing. It's probably what makes me enjoy weddings so much. My wife, Jennifer, and I freshly married.